Entertainment show hosted by Mrs Brown. Agnes and the family are joined by the nation's favourite sofa couple, Holly Willoughby and Phillip Schofield. In this episode, Agnes opens her doors once again to the very bravest celebrities and she is told a few home truths by a psychic in the studio audience, before asking some typically risky questions to Holly Willoughby and Phillip Schofield, teasing him about his hair and praising Holly for her recent awards haul. 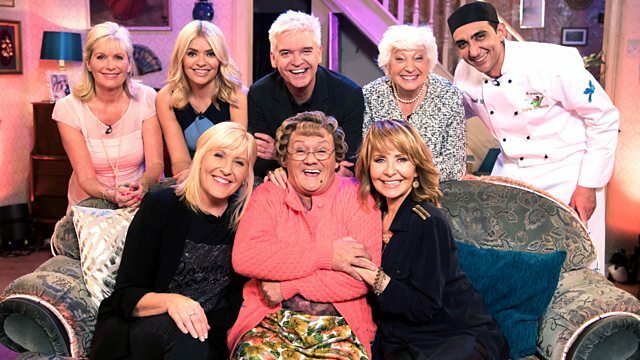 They are both joined by their mammies on the sofa in the Cathy Brown Show, where we find out where their famous giggling fits come from on This Morning. Lulu lets rip with her iconic voice and Agnes is forced to put money in her own swear jar, Phil and Holly are put through their paces in the Brown family version of The Cube and another wonderfully deserving mammy from the audience is presented with the Mammy of the Week award. Father Trevor and Father Damien offer up their latest Thought for the Day, while in the middle of a game of poker, chef Aly makes his own version of Holly's childhood favourite. Dermot and Buster recruit Adam Woodyatt for their Celebrity open Top Bus Tour and get him to play along with their chaotic plans as they spout wildly inaccurate facts to the tour group along the way and Ricky Wilson also gets intimate with Agnes in Foley's pub before Kaiser Chiefs play out with their latest hit Hole in My Soul.